At the close of 2015, Forbes released a list of academic degrees that revealed which college majors will get you noticed by employers based on a study by the National Association of Colleges and Employers (NACE). We’ve taken the top four degrees from that list to help you understand what’s most sought after by employers. To view the full list and accompanying article, click here. If you enjoy business mathematics, focusing on the details, and analyzing and comparing data, an accounting degree may be right for you! According to WorldWideLearn.com, accounting degrees lead to some of the more low stress, high compensation jobs available today. It’s also among the top degrees for quick career placement after graduation. A degree like this not only provides a variety of opportunities, it is becoming more in demand as companies try to keep up with emerging technology trends. Companies need employees with computer science knowledge to help them problem solve, analyze, and provide a broad understanding of technology. A finance degree is very appealing because most companies need people to crunch the numbers. No business can run without having its finances managed, so it’s easy to see why this kind of education will catch an employer’s eye. And, your opportunities within the finance realm are many. You can find a wide range of jobs from economics, personal finance, retirement advisory, and more. Employers are also likely to notice those candidates with a business administration degree. This field opens doors in a wide-range of capacities for a company, including general business operations, marketing, management, sales, and more. 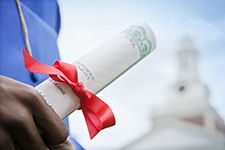 Earning a degree is a commitment of both time and money, but it can prove invaluable in your job hunt. Are you currently pursuing a degree, or want to get started? What path would you choose? Let us know your thoughts in the comments section below. Previous Post What’s Wasting Your Time at Work? Currently have an associates in political science and will be pursuing my bachelors this fall 2016 in business management.